Yesterday, we ushered in another month of study. The book shared this time is "Sports Transforming the Brain", and the event was hosted by two colleagues in the R&D department. Before sharing, we made a small game, divided into four groups, each of which was fully involved. There are eight winners, and each winner has a corresponding red envelope reward. The way to share books is still to watch Fan Deng’s class, and every little friend has watched and concentrated. We know how important exercise is to our lives. It can change the state of stress. It is the root cause of anxiety. It is the shackle of getting rid of depression, and it can overcome addiction, regulate hormones and delay aging. The principle of exercise is: more and more brain cells move. 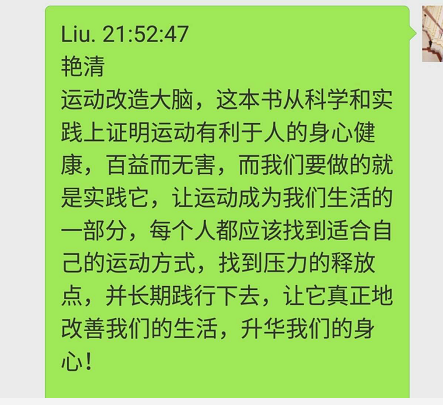 After the end, we also expressed our feelings on WeChat group. The following are the thoughts shared by three excellent sharers. Exercise and reading have a great help to our lives. All the staff of Huapusen sincerely appeal to everyone: love sports, love to read, and have a happy and happy life.